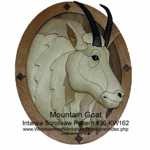 This Mountain Goat Head scrollsaw pattern can be cut out in two different ways. You can cut out the head only or you can choose to include the background and oval. Both pattern options are included. Depending on which you choose there are either 31 or 44 pieces required to complete the project, which measures 15 inches high by 12 inches wide including the oval.